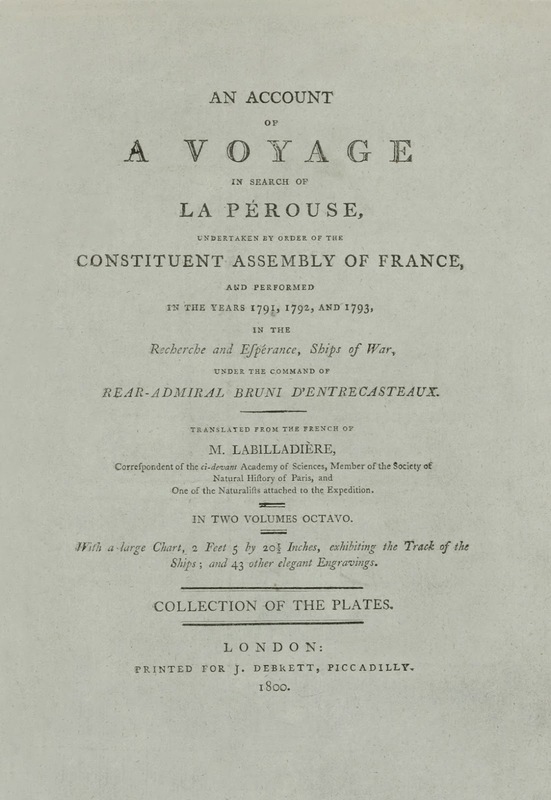 An account of a voyage in search of La Perouse: undertaken by order of the Constituent Assembly of France, and performed in the years 1791, 1792, and 1793 in the Recherche and Esperance, ships of war, under the command of Rear-Admiral Bruni D'Entrecasteaux. 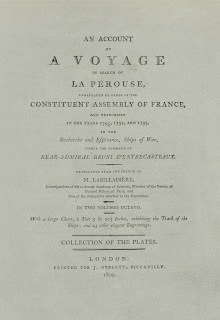 Ref: An account of a voyage in search of La Perouse, title page, M. Labillardiere, 1800, Sir George Grey Special Collections, Auckland Libraries, 1800 LABI Atlas. This three volume set was published in 1800. The first two volumes were acquired by the Leys Institute Library Ponsonby in 1905 and some decades later transferred to Sir George Grey Special Collections. Volume three, an atlas including many beautiful engraved illustrations, was recently purchased, thus completing the set over a century later. 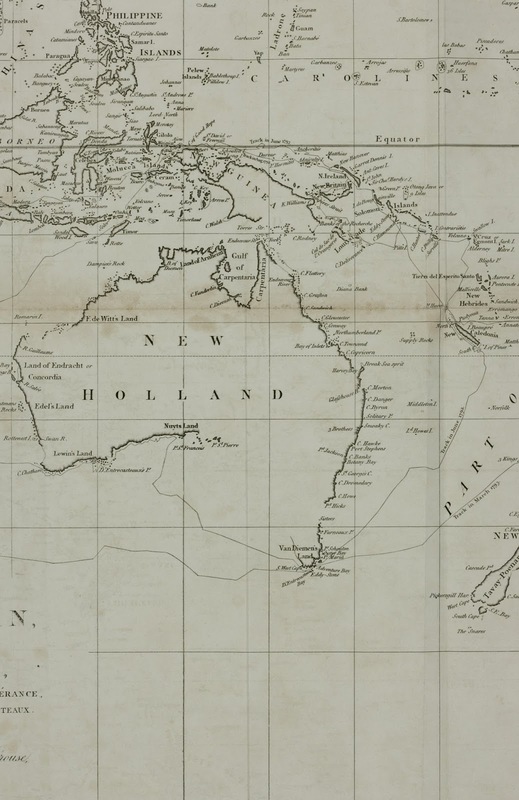 Pictured are parts of the map inserted into this atlas, showing the world as far as it had been charted. The route indicated is that of the 1785 voyage of Jean François de Galaup, comte de Lapérouse (1771-1788? 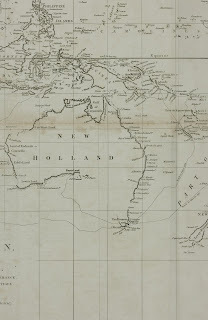 ), as retraced in 1791 by two ships commandeered by Rear Admiral Bruni D’Entrecasteaux. Many territories surrounding the Pacific, including the islands of what we now call Micronesia and Melanesia, were still being charted at the time of these expeditions. Ref: An account of a voyage in search of La Perouse, map 3, M. Labillardiere, 1800, Sir George Grey Special Collections, Auckland Libraries, 1800 LABI Atlas. Jean François de Galaup, comte de Lapérouse (1771-1788? 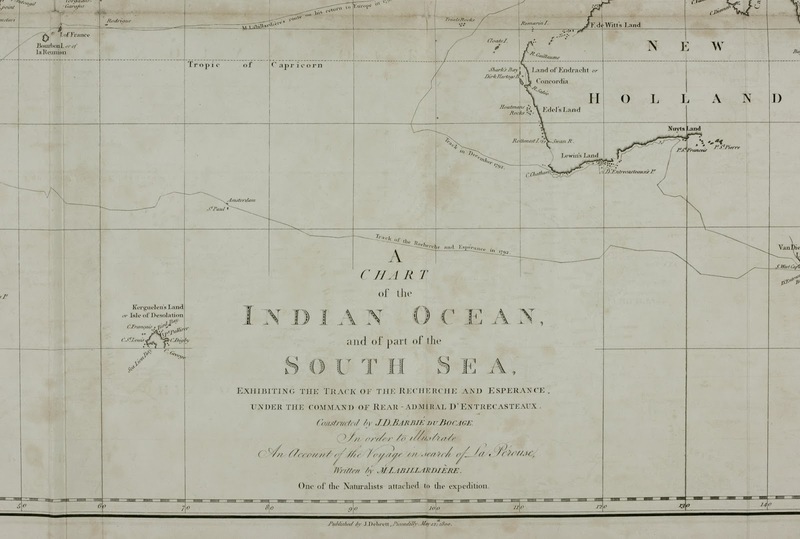 ), was a naval officer appointed to lead a scientific expedition aiming to extensively explore the North and South Pacific, correcting and completing maps of the area, enriching French science and establishing maritime routes for trade. His ships the Astrolabe and the Boussole travelled to Chile, Hawaii, Alaska, California, East Asia, Russia and the South Pacific. His last recorded landfall was in New South Wales, where his ships stopped for resupply in January 1788. On 10 March 1788 he departed for New Caledonia and the Solomons, but neither he nor his crew were seen again. Ref: An account of a voyage in search of La Perouse, map 1, M. Labillardiere, 1800, Sir George Grey Special Collections, Auckland Libraries, 1800 LABI Atlas. 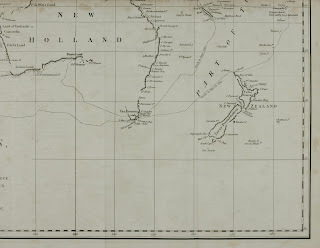 A rescue mission headed by Rear Admiral Bruni d'Entrecasteaux brought the ships Recherche and Esperance via La Perouse’s intended the route: around Australia and islands to its Northwest. In the area now known as the Solomon Islands, at Vanikoro, a coral atoll surrounded by coral reefs, D’Entrecasteaux believed he saw smoke signals, but investigation was prevented as he found the waters around the atoll too treacherous to navigate towards them. D'Entrecasteaux later died of scurvy on the trip, and the expedition returned to France. 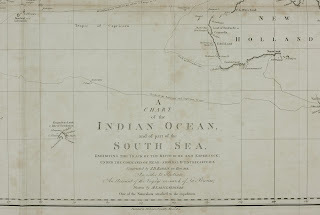 The botanist on the ship, Labillardiere, published this account of the expedition on his return. Ref: An account of a voyage in search of La Perouse, map 2, M. Labillardiere, 1800, Sir George Grey Special Collections, Auckland Libraries, 1800 LABI Atlas. In 1826, an Irish sea captain made another attempt to piece together the circumstances of the Laperouse expedition’s disappearance. His enquiries resulted in the collection of some evidence of ship wreckage from the coral reefs around Vanikoro. It was not until 1964 that the wreckage of the Boussole was fully recovered, and further expeditions were dispatched by the French government in 2005 and 2008. The plates contained within this book are stunning engravings of the drawings by one of the illustrators on board. The Auckland Art Gallery has digitised some of these plates. La Perouse has been memorialised in New Zealand by having a glacier and a mountain named after him. 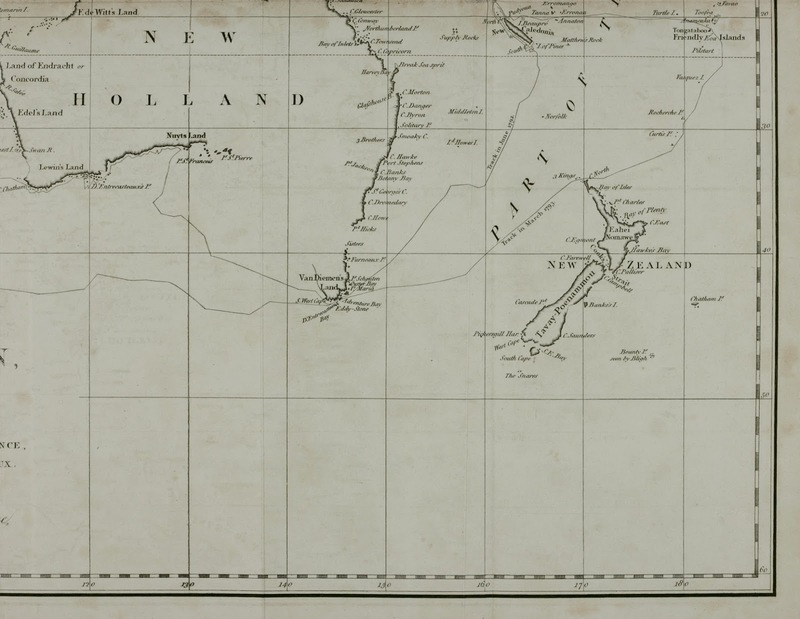 According to the Reed dictionary of New Zealand place names Mt La Perouse was initially called Mt Stokes, but as that had already been claimed in Marlborough the mountain was named after La Perouse like other notable navigators, including Cook, Tasman, Dampier, and Hicks, whose names are commemorated in the Southern Alps.